The recipe is easy to do, and tastes so good. Brining helps keep the chicken real moist during cooking. And, the process of brining is a lot better than marinating because it draws the flavors in the brine into the chicken better along with the liquid to help keep the cicken moist and tender after cooking. 1. Make the brine by combining the first 5 ingredients. 2. Place the chicken in a plastic bag, add the marinade, and place in the refrigerator for about 24 hours, or as long as 2 days. The longer brining time will insure that all the flavors have totally penetrated the chicken. 3. Take the chicken out of the brine and dry it real well. 4. Set up for "Three Stage Dipping". Mix 3 cups flour with the Blacken, Salt and Garlic Powder. Place 1 cup of this mixture in one bowl, and 2 cups in a larger bowl. Mix the egg wash together, with a whisk, in a small bowl. I use the milk, because I like a thinner crust, and it helps to blend the eggs better.. If you want the crust to be thicker, just omit the milk. 5. Lay 3 legs and 3 thighs, one piece at a time, in the flour mixture then turn over. Take out to coat with this flour mixture. 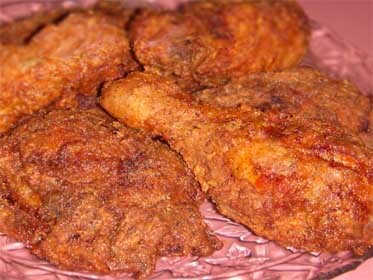 Rub the flour into the chicken with your hands, don't shake off the excess and place in a pan to get ready for frying. If you'd like a real thick batter on the chicken, after you've done the breading, just dip it back into the egg, then the flour a second time, you'll end up with a Super Thick, and crispy chicken. 6. Heat the oil to about 300 degrees. I like using my black frying pan. 7. Place the chicken in being careful not to splash the oil. Leave the chicken alone for 10 - 12 minutes. 8. When you start to see some blood being forced out of the chicken (this means that the chicken is cooking), carefully turn them over. Leave another 10 - 12 minutes. The second side should be well colored. 9. Take them out with tongs letting them drain on a rack in a shallow pan. I drain anything that's fried on a rack, instead of papers towels, because, I feel, that I end up with a crisper product. Quite often, Southern Fried Chicken is served on top of a waffle, with honey drizzled on top. Since you've already got the flavor of Real Maple Syrup, I'd just drizzle some more of that on top.